Langkawi is a picturesque island, which is having various advantages. The most unusual is the versatility of the island: in spite of its small size, here you will find everything for both a budget traveler, and for the most spoiled tourist. Langkawi will perfectly suit the backpacker, the newly married couples, the families with children, companies of students, and even the most demanding retired people. You should definitely take a stroll along the beach of Chenang during the evening low tide. A sea, which exposes the shore, would make it possible to see a lot of crabs, fish, sea urchins and sea stars. Undertake a leisurely journey around the whole island by car, which you may rent in Langkawi. For the space of 80 km of the road, you could see almost all the beaches, climb the ropeway to a height of 700 meters above sea level, feed the monkeys, visit most of the island’s attractions…This is just a small part of the complete impressions! Stunning views, beautiful photos and great mood are guaranteed! But keep in mind that even driving at a speed of 80 km/h, your trip could last for the whole day, because of the many interesting places along the way. Low prices, wide range of fruits and seafood, unforgettable local colours, as well as many yummies, which are prepared right in front of you – it should be visited! To nourish on Langkawi is not much more expensive, than in Thailand, and even sometimes cheaper. The night market in the northern part of Chenang, on Bohor Tempoyak Street, is a wonderful place for a budget traveler! It works on Thursdays from 17:00 to 22:30. Spontaneously appearing once a week, on the area of ​​about 20 to 50 meters, it is having absolutely everything, which is not in sight at the two-kilometer tourist street Pantai Cenang. Clothes, slippers, jewelry, bags, dishes, toys, memory cards… Vegetables, fruits, meat, fish, seafood. A lot of different food prepared in front of you: kebabs, sausages, chicken legs, spring rolls, rice, vegetables, omelets, pastries, Thai noodles and other exotic delicacies. In Chenang, the market works only on Thursdays. On different days of the week, such markets are operating in different parts of the Langkawi Island. For example, on Tuesdays it takes place nearby – on Jalan Kedawang Street, next to the Pasaraya Kedawang supermarket. It is called the “night market” because the night draws on earlier in the southern latitudes and it is getting dark to the beginning of the market. The local traders from all around the island are coming and unfolding the tent rows. The electricity is taken from their cars and portable diesel generators. The food is cooked on a grill or on gas stoves, which are connected to the cylinders. The refreshing drinks of the most bizarre colors and flavors, with a huge amount of ice, are quite popular here. The most beautiful beach is Langkawi is the Kok beach, where a cable car is situated. In such places, as a rule, you feel peace, solitude, energy, spirituality, the desire to start a new life. Here you can whisper quietly to yourself or to shout loudly: “Let the whole world wait!”. You are feeling, as on the edge of the world. The beach Kok is situated very close to the Oriental Village. 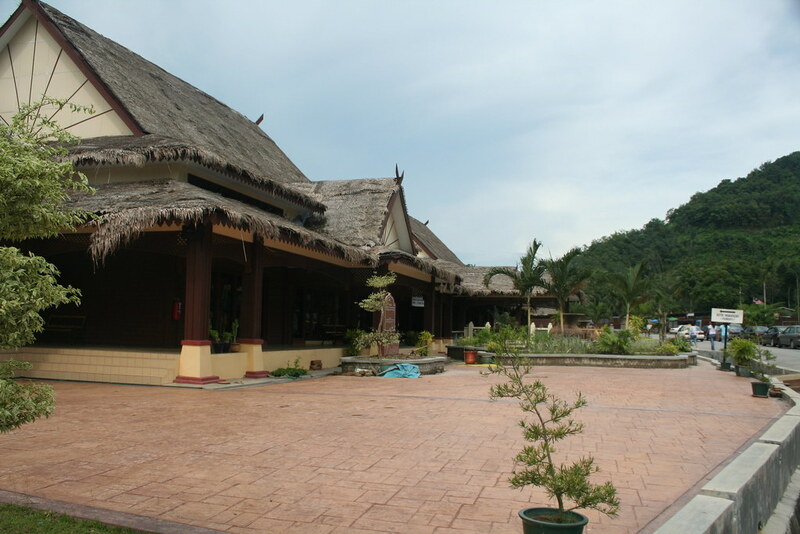 Coming closer to the beach, you will find a nice pavilion, a cozy little restaurant and a very small parking lot. Kok Beach is quite a secluded place. A little away from the central part of the city, you are already feeling yourself almost like on a desert island! Right opposite the Kok beach, there are small islands, one of them (in the northern part) you can literally reach by foot. Kok Beach stretches, as a meandering line, from the bay in the south, to a small rivulet from the Eastern Village, in the north. Kok Beach is a very beautiful and colorful place, which is ideal for photo shoot. On the beach, you can sunbathe and swim, make superb photos, sway on the swings, walk in the woods and, probably, even arrange a picnic. Langkawi Island is famous for its cable car. It starts in the Oriental Village. The modern cabin raises the tourists to the top of Mount Mat Chinchang. From this point, the whole island is spread before your eyes. In set-fair, you can see the Thai shores in the north, and the silhouette of Indonesia – in the west. The cable car is included in all tourist routes. It is located at an altitude of 708 meters. The air temperature at the top of the mountain is about five degrees lower, than at its foot. It is the largest oceanarium in Asia, which is famous for the fact that it has more than 5 thousand of marine inhabitants, which are placed in 100 cisterns. The uniqueness of the construction is in the fact that it is a 15-meter tunnel, which is filled with 800 thousand liters of seawater. Here you can admire the diversity of the underwater world. Predatory sharks swim very close to the visitors. They are separated from the other marine inhabitants by the 38 mm-wide highly robust glass, which is very rare. This construction is located very close to the capital of the island – the city of Kuah (17 km). It is having a sad, but slightly embellished legend, which goes that the white sandy beaches of Langkawi Island are nothing but the bright blood of an innocent beauty, the princess Mahsuri, who was accused of betraying her husband and killed. In vain she tried to explain that her enemies had calumniated her, the judges were inexorable. During the execution, all the inhabitants of the island saw that the blood of a young woman was white. That was a proof of her purity and, therefore, confirmed that an unjustified murder was committed. Dying, the princess said that in the future the island should expect various troubles – black buffaloes would bring white cows into life, the sand would turn black (the black sand now covers the beach of Pasir-Hitam), and the island of Langkawi would completely disappear. At the beginning of the nineteenth century, the Thais repeatedly tried to wipe the island of Langkawi off the map, and the man, who was guilty of the princess’s death, suddenly died. On the place of an innocent victim’s murder, the Mausoleum of Mahsuri was built. It was made from a snow-white marble, like the soul of a young woman. The tourists from all over the world come here to offer homage to innocence and purity. The grave of Mahsuri is now a place of worship. It is necessary to take off your shoes at the entrance to the mausoleum. In the garden, you will be shown an ancient well, which, according to legend, the princess dug out herself. Even in the droughty months, it does not dry up. The locals insist that if you wash your face with this water, the happiness will never leave you.